The one with Zoya Surf collection Carly! Oooh it's almost the weekend! I think I'm gonna get to gave a lazy weekend, so I'm really looking forward to it! 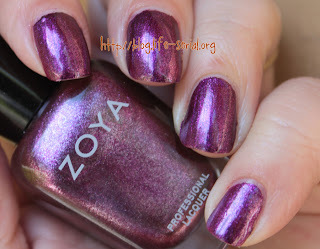 For today's post, I bring you Zoya Carly, a deep, bright purple. I only needed one coat! Who doesn't adore a good one coater? 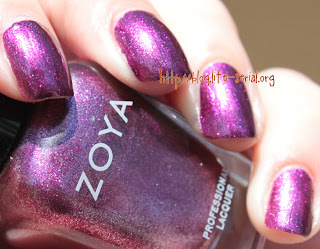 On Zoya.com, Carly is described as "Very rich, bold, red-toned dark purple with iridescent red and silver metallic shimmer and a dense foil finish. The bold color and sparkling foil finish make Carly like gift wrap for your nails." I had trouble photographing Carly. My nails look like they are swimming with the metallic shimmer. But with only one coat, Carly is cool! I just don't like I like it for myself. See what I mean about the sunlight pictures? Looks like the shimmer is swimming only nails. I have that issue with darker metallics sometimes. But regardless, the formula on Carly is superpigmented and goes on like butter - especially for one coat! I'm just not fond of the color. It's pretty, it's just not me. I think it reminds me too much of Jem. Did I mention my 1111 follower giveaway is up? Have you entered? Only a few more hours!